Nearly all vendors have Co-op marketing programs in place yet, more than half of them aren’t satisfied with the Co-op management platform they use. The basic reason for vendors’ disapproval is reported to be the “complexity” of their Co-op management platform. The nature of Co-op advertising programs demands a flexible and time-saving system that can assist the channel manager in gauging the performance of their marketing programs. Therefore, it’s not surprising that small businesses are still utilizing the more traditional methods of managing their advertising funds and programs. A 2017 study from Wakefield Research and Concur reported that 84 percent of small businesses are still using some sort of manual process. Co-op marketing funds are used in an indirect sales channel where funds are made available by a vendor to help channel partners (resellers, VARs, distributors, etc.) sell more products and create local awareness for the brand. Co-op programs are accrual-based, awarding channel partners based on previous sales data. 42% have errors in matching invoices to their clients. 42% experienced errors reconciling invoices. 47% have experienced delays in processing vendor orders. 41% have incurred late fees on payments that were lost in their handwritten mess. 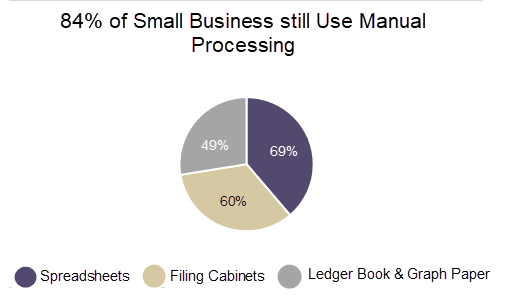 Overall, manual processing is time-consuming and often inaccurate or incomplete. There are far more efficient, automated, cloud-based alternatives that can more accurately process, track and accrue funds. These alternatives often include robust communications with full tracking of all marketing efforts and comprehensive visibility into activities across all channels. Implementing a successful Co-op campaign require focus and investment to develop, implement, adjust and perfect. As a result, these campaigns require an attentive utilization of strategies and proven best practices. In the competitive world of channel marketing, waiting for the manual administrative campaign reports to see if your Co-op campaign needs any adjustments is detrimental to your business’ success. An automated Co-op management system provides analytical reporting, constant tracking, and measurement of your campaign’s ROI. These functionalities give you the power to react quickly in cases any modifications to the campaign is needed. If you are looking to upgrade to an automated, web-based Co-op Management platform, or are considering to switch to a new, more robust platform, then you have landed on a right page. Before determining the right solution for managing your Co-op programs assess your short and long-term goals, your channel partners, and your business components. Perform an extensive research on the platform provider. The solution provider and/or their developers should have a thorough knowledge and experience working in the field of Co-op program management. Integrated systems present your brand with significant savings. Therefore, you should pick a SaaS Co-op/MDF management system that provides a centralized platform capable of managing the entire “request-approve-claim-validate-authorize-payment” cycle. Select a platform that offers coherent and easy to follow processes for your channel partners to access, submit prior-approvals, upload claims, and access reimbursement information. Look for the platform’s flexibility in integrating with your existing channel management systems. Also, make sure the platform you choose has the capabilities to extend for additional services in the future. Consider a new Co-op management platform that presents you with the tools to easily design new marketing programs using your actual distributor and reseller performance data. A powerful and flexible system offers functions for setting-up multiple fund opportunities and multiple fund types. Select an integrated platform that supports accrual and discretionary funding models. Look for a platform that provides Co-op balances for YTD, total earned, total claims, claims pending and claims paid out through an easy-to-use, online dashboard. To monitor the success of your Co-op campaign, consider an application that provides real-time data collection and reporting on your resellers and distributors’ activities such as balances, prior approvals, claims, and check requests. Choose a system that can automatically identify and inform your team when claim forms are incomplete. Only completed forms should reach the claims processing desk. Make sure the system has the capability to track and measure your channel programs and Co-op campaign’s ROI. Look for a system that is capable of generating custom analytics and offers segmented reports by territory, reseller, product, and distributor. Make certain that the system offers data security and provides services to keep your privacy policies secure and maintained at all times. Insist on a fully-hosted, online solution with service level agreements that guarantee instant and secure access, 24/7. Co-op payments represent a consequential responsibility that needs to be tracked with a complete audit trail. Evaluate the system based on its performance, speed, and data recovery capabilities. Finally, select a platform that can integrate with your resellers and distributors’ point-of-sale data collection and ERPs and CRMs systems your company uses. Our Web-based Co-op/MDF Management solution manages the entire “request-approve-claim-validate-authorize-payment” cycle of advertising incentive programs. We have designed an automated Co-op/MDF management solution to ideally assist both channel partners and in-house co-op personnel to expedite prior approvals and claims. This helps your channel partners meet their deadlines. In addition, you can more readily monitor and administer every aspect of your Co-op campaigns—anytime, from anywhere. With CMR’s Co-op solution, you provide easy co-op access and visibility to your partners around the world, around the clock. Therefore, your partners become more aware of the funds available for usage, apply those funds to sales and marketing activities, and thus increases sales. As a result, further co-op funds are generated, and in turn, utilized to increase sales—fulfilling the purpose of your Co-op Program.